I'm serious, you have to go to Vegas...at least once. For better or worse, there is no place like it anywhere else in the world. Of course Vegas isn't the only city of its kind, but it's the biggest. A giant adult playground, Vegas is a fictitious city where you can find the entire world in one place, well... sort of :-) Where else can you walk a few city blocks and get to see New York, Paris, the Northern Italian lakes, and Venice? (I'm sure everyone who wrote about Las Vegas asked that question). In Venice you can even take a gondola trip through artifical canals and be serenated by the gondoliers (for less than in real Venice). The Bellagio has reproduced Lake Como which lies right across the street from Eiffel Tower and the Arc de Triomphe. The Mirage has a volcano, erupting every 15 minutes from 7 p.m. to midnight. Treasure Island has pirate ships. Illusion is everywhere. 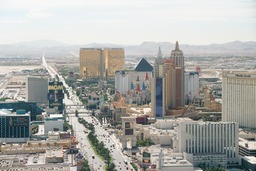 Needless to say, the big draw of the city is Las Vegas Boulevard, better known as "The Strip". Its style and decoration range from classy to tacky and everything in between. The pop culture capital of the US, Vegas is kitsch but it can also be fun. And yet ... there is something distinctly sad about the spectacle of gambling, which pays for everything. There's a lot to do in Las Vegas besides gambling but the end result of the majority of Vegas fun is an emptiness that forces you to question some of the values of the western world. I find myself getting tired of Vegas pretty quick and after a couple of days I want to move on, see things that are more real. The good part is that one can find these places right around the corner from Las Vegas. Within a relatively short drive one can see Hoover Dam and about 5 hours further west is the spectacular Grand Canyon. Death Valley in California and Bryce Canyon NP and Zion NP in Utah are also reasonably close and very beautiful. Still, I believe Las Vegas is worth seeing at least once, due to the sheer size of it all.